Forget everything you may have seen and done so far, because this long and narrow land hides often-unimaginable treasures, the product of a history that has left its undeniable mark, such as from the wayfarers and pilgrims who travelled along the ancient salt routes. Here, where the mountains stand out against the blue of the sea and the hilly area rises and unwinds along a thousand different trails, mule tracks and sometimes simple footpaths. 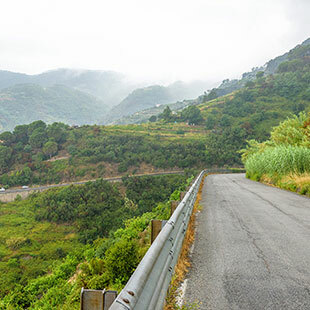 Liguria on two wheels is, in fact, a continuous alternation of ups and downs and ascents, some longer than others, in its hinterland. 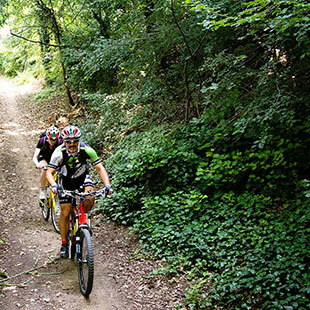 You can reach heights of over 1,000 metres above sea level, as in the case of Mount Ceppo. 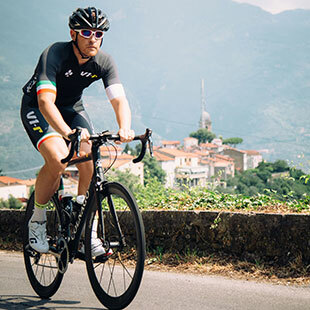 However, in Liguria, even the routes below this altitude are able to test the most trained legs. 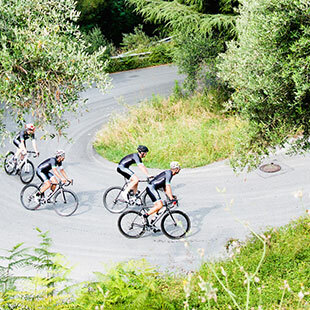 Wherever you may decide to ride, the lowest common denominator is the presence of switchbacks, which offer cyclists a natural training ground of rare beauty overlooking the blue of the Mediterranean. 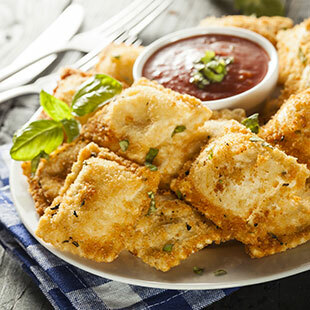 This delicious dish, a tradition of the Ventimiglia hinterland, consists of fried ravioli stuffed with pumpkin and cheese (“barbagiuai” in the local dialect) and is characterised by a the rather particular contrast between the sweetness of the pumpkin and the strong and sharp flavour of the fermented ricotta. When one mentions pesto, Liguria immediately comes to mind. “Pesto alla genovese” is made strictly with basil, extra virgin olive oil, grated cheese (Parmigiano Reggiano or Grana Padano cheese and aged Pecorino), sweet garlic, salt, pine nuts and walnuts. The pesto is used as a condiment for pasta such as tagliatelle, which in Cinque Terre are prepared without egg added to the pasta dough. Bluefish is typical of Cinque Terre, like anchovies, which here are called “gianchetti” or whitebait and which during the summer months are the protagonists of many local food festivals. Another typical seafood dish in the Cinque Terre area are mussels, prepared with a slight squeeze of lemon juice and a pinch of black pepper, or stuffed with seasonal vegetables. 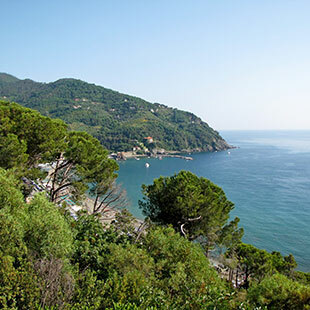 Liguria is a land with a long and rich history. The many testimonies of prehistoric times, from caves to the Palaeolithic tombs and necropolis spread throughout the region are certainly proof of this rich past. 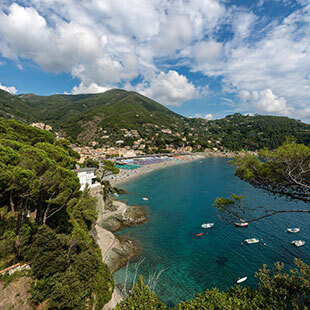 One of the more famous towns in this region is no doubt Finale Ligure, along the Ponente Riviera. The town has Saracen origins and has been named as one of the most beautiful villages in Italy, with its splendid historic centre of Finalborgo, surrounded by medieval walls. A plunge back in time, with Renaissance palaces, ancient churches and archaeological finds along the town’s streets. Let’s also not forget Loano, old village of ancient Roman origins, for centuries the manor of the Doria family, which preserves numerous 16th century houses including the grandiose Town Hall; and just a few miles away, the Tirano caves. The Levante Riviera, on the other hand, offers an unequalled naturalistic and historical heritage: Cinque Terre, with its 5 seaside villages that tell their story through the characteristic coloured houses, the sanctuaries connected to each other by trails (some also accessible by car), the remains of castles and fortifications built to counter the Saracen threat and the churches constructed in typical gothic-Ligurian style.